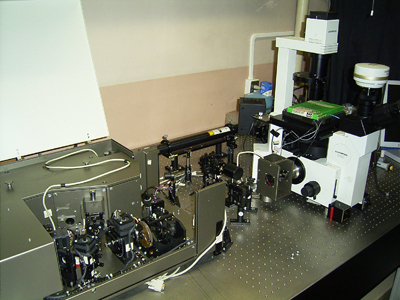 This system is used for the measurement of time- and space-resolved Raman spectra and time-resolved Raman images of living cells, liposomes and microcrystals. 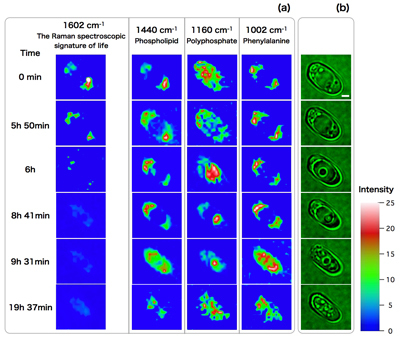 We trace a spontaneous cell death process of a single budding yeast cell by Raman images at 1602cm-1 ("Raman spectroscopic signature of life" reflecting the metabolic activity of mitochondria), 1440cm-1 (phospholipid), 1160cm-1 (polyphosphate) and 1002cm-1 (phenylalanine). Between 5h 50min and 6h, a "dancing body" appears. 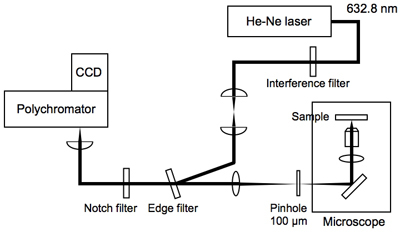 The Raman images show that the metabolic activity of mitochondria is lowered concomitantly with the sudden appearance of the dancing body.